A live act performs at Nashville’s Sutler Saloon, which features a RoomMatch® system from Bose® Professional. The Sutler Saloon, featuring a RoomMatch® system from Bose® Professional. 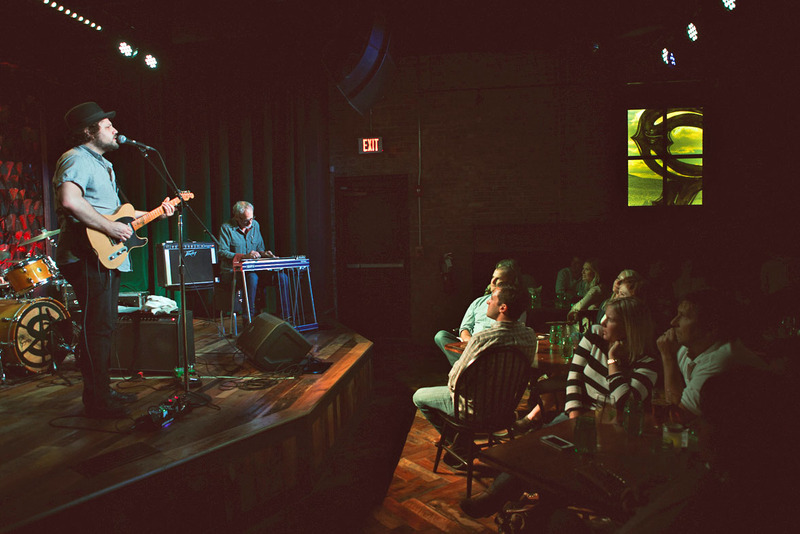 Framingham, Massachusetts, March 3, 2015 – The Sutler, opened in 1976 by former country music DJ Johnny Potts, has a special place in Nashville’s history, having hosted performances by such luminaries as Willie Nelson, Johnny Cash, Steve Earle, Don Everly, Garth Brooks and numerous others during its 30-year run. Although the original establishment shut down years ago, it was been resurrected by new owners as the Sutler Saloon, close to its original site in Nashville’s Melrose neighborhood. 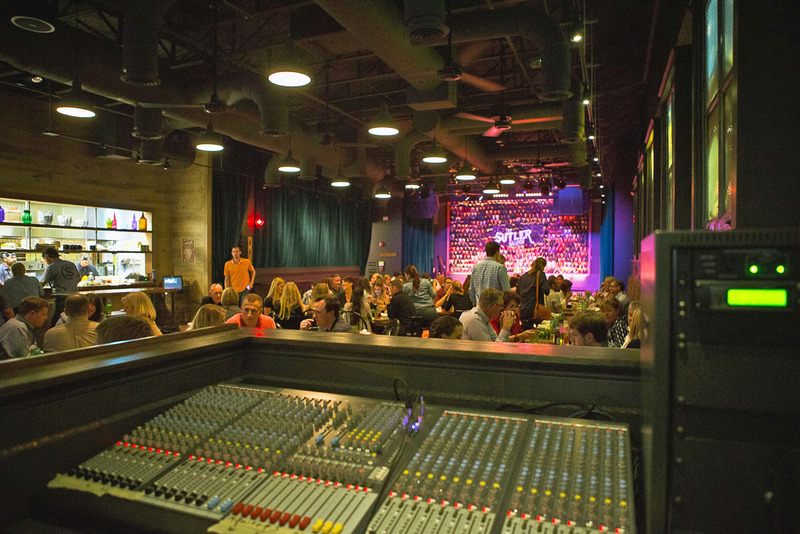 The restaurant and bar recently opened for business with an installed RoomMatch® loudspeaker system from Bose® Professional for the upstairs live music stage and Bose FreeSpace® DS 100F pendant loudspeakers located throughout the 8,000 square-foot building. “It’s a unique music venue and sounds amazing,” according to DeWayne Rains, vice president of operations at Audio Electronics, Inc. in Nashville, who designed and installed the Sutler’s AV systems. The owners not only installed a state-of-the-art Bose sound system, but also budgeted for acoustic treatment, complemented by velvet drapes, leather banquettes and wood floors, in the live music room. ABC’s hit series Nashville was quick to take notice of the new venue. During a recent third season episode, “I’m Coming Home to You,” Layla Grant (actress Aubrey Peeples) performs at the Sutler Saloon. The system, flown above the stage, comprises one each of RoomMatch RM284520, RM286040, RM452820 and RM602840 modules, plus a single RoomMatch RMS218 subwoofer. Four Bose PowerMatch® PM8500N configurable, networked amplifiers power the system, which is driven by an Allen & Heath analog mixing console. Audio Electronics also installed background music systems in both the upstairs restaurant and The Cellar bar downstairs, each comprising nine Bose DS 100F flush-mount loudspeakers in pendant kits. The system in The Cellar additionally accommodates an intimate performance area that hosts songwriters and also includes a single Bose Panaray® 402® Series II loudspeaker for artist foldback. Photo Caption 1: A live act performs at Nashville’s Sutler Saloon, which features a RoomMatch® system from Bose® Professional. Photo Caption 2: The Sutler Saloon, featuring a RoomMatch® system from Bose® Professional.